Just when you think you don't need another Sharpie they come out with a line that is made just for fabric. Had a few projects in the past you have used Sharpies on and had them fade away or wash out completely in the laundry? Try these out for size! They are wash-fast and won't disappear the moment water and soap touches your work. The colors POP! They are bright and vibrant and can even be built on, meaning that you can go over the lines or area and make the color even more vivid. The brush tip is great to work with. With little to no pressure at all you can lay down smooth crisp color and fine lines. Twist that brush sideways a bit and you have the surface area to make fat lines or fill in spaces with the quickness. After use, wash your decorated items without worry. The ink resists fading on most fabrics during normal wash cycles. For best results, machine-wash fabrics in cold water and hang them to dry. It's good to keep in mind, like most markers, if you are planning on using them on a loose-knit material or one with low thread count the ink may bleed out a bit. Set of 8 includes one each of each: Black, Blue, Red, Green, Pink, Orange, Purple, and Yellow. 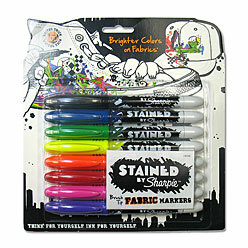 These sharpies are easy to use and produce dye-like colors. Colors are bright and pure. These are great especially for fine lines. The dyestain doesn't bleed much. I wish they were refillable because I go through them very quickly ! These worked perfectly as advertised. We are using them on dish towel sized banners to commemorate our kids' 50th birthdays at a big party for all three of them (cousins). These are being used at a workshop scheduled for mid April but I just couldn't wait to give them a whirl! Worked beautifully... had lots of fun!